One Lucky Day: Jingle Tag and a winner! It has been wonderful reading all your Christmas memories! Some are funny and others are heartwarming. Most involve family, some long gone, and the good feeling we had for them. One of my favorite memories is picking out the Christmas Tree with my parents. One particular year, I picked one that was WAY too big to fit in the living room (a common problem for me), but my dad bought it anyway. Once home, he had to chop a foot off the trunk as well as many of the lower branches just so he could get it in the front door. We had to forgo the tree topper that year for obvious reasons and I am sure we used more boxes of tinsel than ever before! Sweet memories of a kind dad. "I have been blessed to have a "zillion" yrs of Happy Christmas memories. If I had to pick one, it would be in the early 80s when I discovered that my sweet, 11 yr old paperboy's family was in great need. The story is far too long and detailed to recount here. Let me just say that Christmas, I never felt more like I imagine Santa must feel as he gives to all each Christmas Eve. I anonymously left gifts and food on Christmas Eve but somehow the family figured out it was me. They showed up on my doorstep at 8 a.m. on Christmas Day. Seeing the joy on their faces and feeling the love in their hugs, made my Christmas all that it could be. When James' Mom, who was crying, hugged me and whispered in my ear "Thank you for making this the best Christmas we have ever had!" it filled my heart to the brim. Just now, as I recall the details of that experience, my eyes are filled with tears. To me, the TRUE meaning of Christmas is in the GIVING. You can't beat the joy and love you feel in your heart. For me, those feelings live in my heart each day of the yr and they make me a better person. No matter how great or how small the gift, whether it be wrapped w/paper and bows or you give the gift of your time or your presence, the love with which it is given and the joy with which it is received, makes for the BEST CHRISTMAS EVER"
There is a new question at the end of this post for the Friday drawing and another prize package! Thanks for playing along everyone! 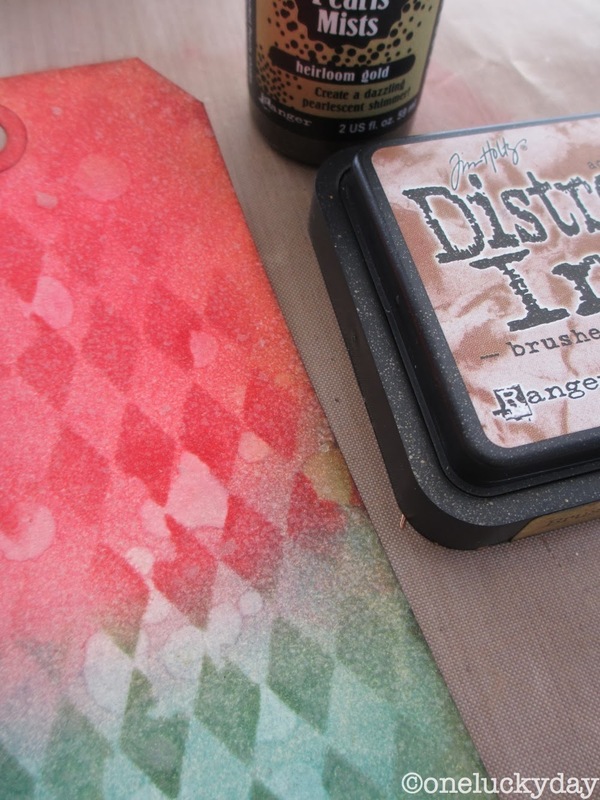 Playing in the Distress Ink again! 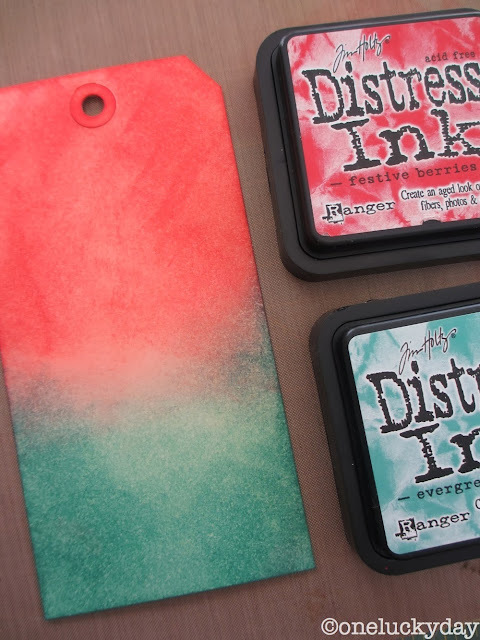 Today I'm using a #8 tag and Festive Berries and Evergreen Bough Distress Ink to create a blended tag. Use a blending tool to add ink to each end of the tag. 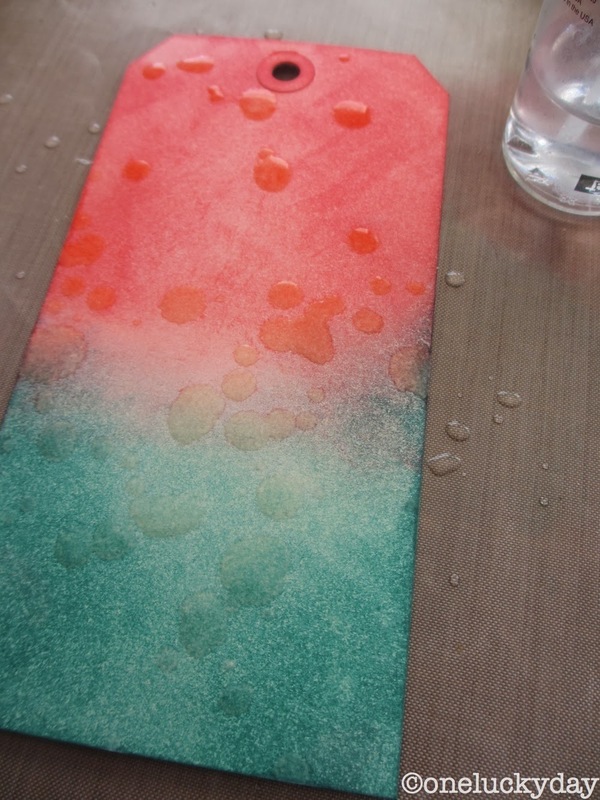 Sprinkle drops of water over the tag, then remove with a paper towel. Distress always reacts with water so the droplets will remove some ink from the tag. 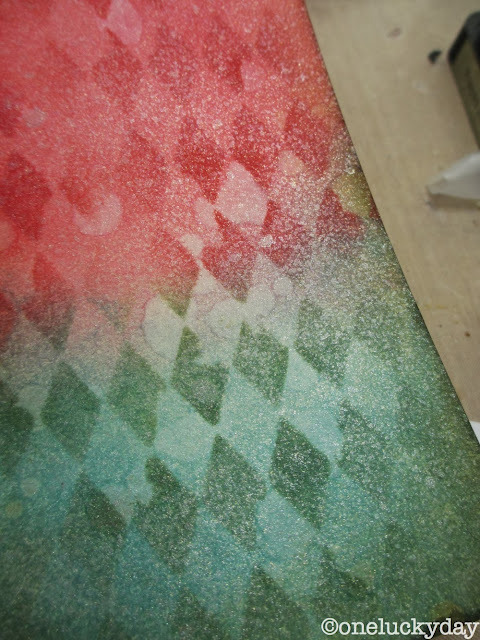 Lay the Harlequin Layering Stencil over the tag and re-ink over the corresponding color. So that it creates the monochromatic pattern. Ink the edges with Distress Ink in Brushed Corduroy and give it a once over with Perfect Pearls Mists in Heirloom Gold for a subtle shine. Hard to see the shine on camera but I promise it's there. 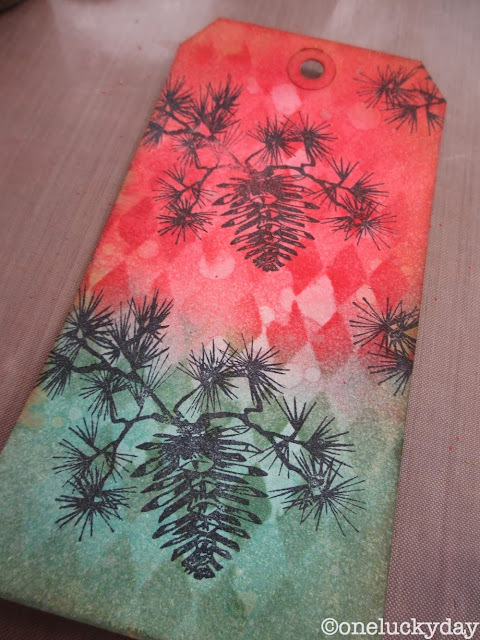 Using black Archival Ink, I stamped one of my favorite stamps - the pine cone branch from the Stamper Anonymous Winter Sketchbook set. Next, I cut 2 bells from Grungeboard using the Mini Movers and Shapers - jingle bell and Christmas bell. I inked each piece with Distress Ink straight from the pad. 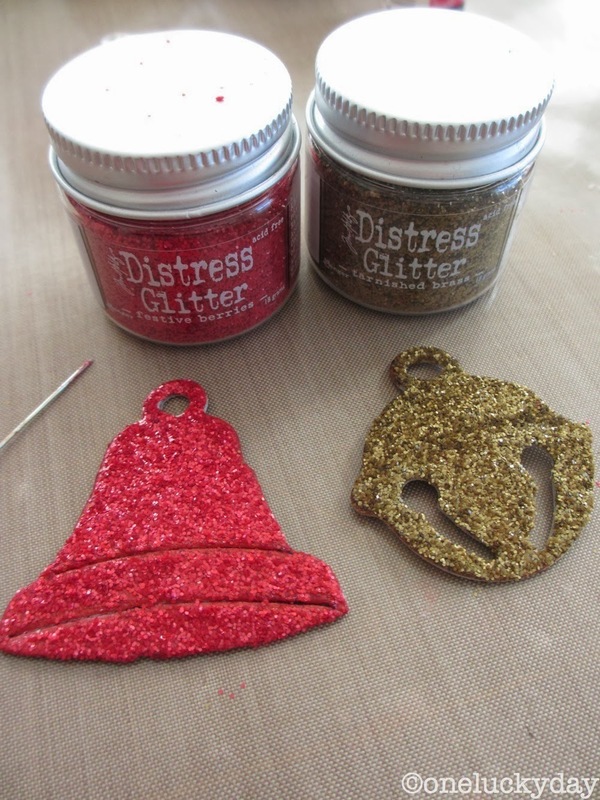 Covered each with a thin layer of Glossy accents (using my fingertip) then poured Distress Glitter over the top. I used a big needle to scrap away the line details. Once dry. I added the two bells to a piece of Trimmings and strung it through the hole at the top. I used the Tiny Attacher to secure the Trimmings to the tag. A couple Chit Chat words, again secured with the tiny staples from the Tiny Attacher. And a Remnant Rub greeting in white - remember the Christmas rubs come with a sheet of white and black. And there you go! Super simple but I just love the background layers. Every step is worth it. Paula my favorite Christmas song, hands down, is the theme song to Charlie Brown Christmas. Definitely has to be "O Holy Night". Love your tag, need to get the stencil! My favorite is "Oh Holy Night." I have at least a dozen versions on iTunes, and love to listen to them one after another. There are so many holiday songs I love, but the one closest to my heart is 'The Gift' by Aselin Debison. Her sweet voice with the amazing lyrics makes me tear up every time, such a meaningful song. I really like this tag! 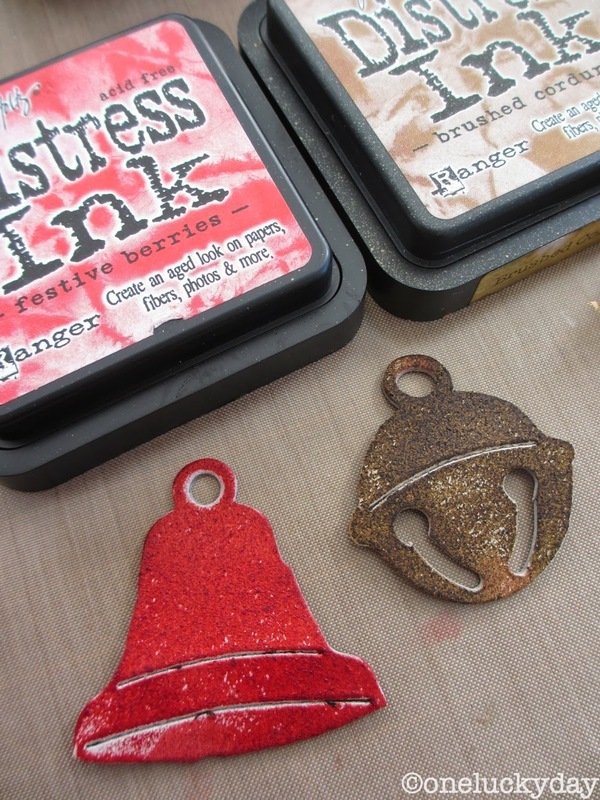 I'm realizing I totally need to order some stencils- they're too fun! I believe it is called The Christmas Song..."Chestnuts roasting on an open fire...." The first one that comes out of my mouth during Christmas time. But please don't bring up that one by Paul McCartney. Simply having a ..... gets stuck in your head too easy. Sorry. Did that just happen? Donna Jean. Mine too is 'White Christmas' Bing Crosby's voice sends shivers up my spine! My fav song is "chest nuts roasting" by Nat King Cole. I can never get tired of his songs... Great tag btw, I might have use this technique for another color scheme. my favorite Christmas song is The Christmas song" by the Chipmunks. Also "Linus and Lucy" by Vince Guaraldi (the peanuts theme song"
I love all the Christmas songs but 'Silent Night' probably tops the list. Christmas eve service by candle light brings it all home. Thank you for another great tag to make and the opportunity to win a giveaway. Merry Christmas! My favorite Christmas music is Silent Night. It is the last hymn we sing in church on Christmas Eve with the lights off and everyone holding a lighted candle. It brings back many memories of Christmases with my Mom. I love your tag. 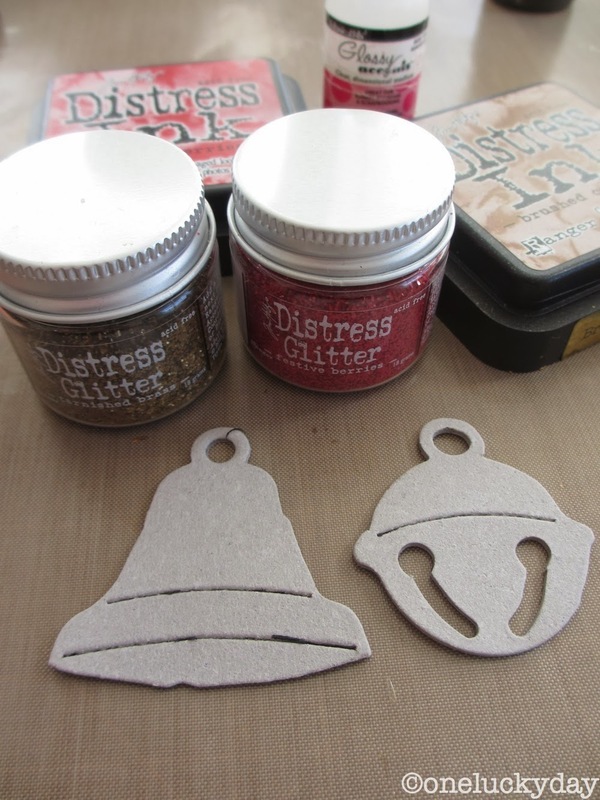 I have the bell dies but haven't used distress glitter with them yet...looks great! I also haven't seen the new red and green inks around here. Love your work Paula! Silent Night. It was the last song I heard my mother sing before her memory completely left her. My last Christmas gift. The tag is wonderful. Every detail is perfect. My favorite Christmas song is "Mary did you know?". Thanks, Paula! Gorgeous tag, Paula! I love how you attached those words. That's so cute! "DASHING THROUGH THE SNOW, TO PAULA'S HOUSE WE'D GO....OH WHAT FUN IT IS TO CRAFT EACH AND EVERY DAY........."
joy you are too kind! we are going to actually meet someday I just know it! Silent Night is by far my favorite Christmas song. Every time I hear it, I cry. I'm even crying now as I type. It just tugs at my heart and places a vivid picture in my mind of that special night when Jesus was born. So beautiful and tender. I love Must Be Santa. It's fun and light hearted. I love the Little Drummer Boy. Great tag! I love Bing Crosby and David Bowie's duet of Little Drummer Boy/Peace on Earth.... I could listen to it for hours! Beautiful tag! Beautiful tag…best wishes for a very Merry Christmas! White Christmas is my favorite! Merry Christmas, Paula! Love love love this tag and the harlequin pattern inking. I need to try that tonight! My favorite is The Christmas Song by Nat King Cole. Merry Christmas! How about my top three? A Baby Changes Everything (sung by Faith Hill), brings tears to my eyes almost every time I listen to it. The Wexford Carol (performed by Alison Krauss, Yo-Yo Ma, and Natalie MacMaster) is another favorite. And finally, I have to give props to the Christmas Song, performed by Tim Reynolds and Dave Matthews. Sorry Bing! Favorite Christmas song - that is a tough one... But I do find myself singing along to "I want a Hippopotamus for Christmas" and the Chipmunk song (Hula hoop) - they both remind me of my childhood and bring a smile to my face. Hands down, Mary did you know! But Oh, holy night is a close second! silent night. it is such a contemplative song. it allows you to think of Jesus, the reason for the season. Fabulous holiday tag, well done! My favorite holiday song is, and always will be, "O Holy Night." Thanks so much for all you give all year-round, Paula! My favorite Xmas song is (forget the actual title) but my part in 6th grade chorus was "perrum a pum pum, rum a pum pum, rum a pum pum". I still remember every word and my part many years later. I always get a kick out of hearing it every holiday because I brings back happy memories from my childhood. Wonderful tag! That pine one stamp just makes it pop. I have a couple of favorite Christmas songs. A classic is the Christmas song and something a bit cheeky is Santa Baby. I so love all Christmas music . I can"t wait for it to start each year. I think my two favorites of all time are Bing Crosby "White Christmas " and Mariah Carey's "All I want for Christmas is you". I love all the old classics and some of the new ones too! Paula, Your bell's tag is lovely and I will scraplift the idea for several of my gift tags! Thanks for all you share with us! Another great tag. One of my favorite songs is Do You Hear What I hear? or just about any Christmas song sung by Bing Crosby. It really brings me back to past holidays with family and friends. My favorite song is "The Christmas Shoes". I always cry when I try to sing along with this song. I love all the happy, upbeat Christmas songs, but this one really captures the true meaning of Christmas. o Holy Night is my favorite- I have a cd with copies of like 10 different artists singing it that I listen to during the holidays- love it! My favorite Christmas song is "I want a Hippopotamus for Christmas"- I sing the song so much, that one Christmas, my husband "adopted" a hippo from the zoo as my gift! My favorite song "I'll be home for Christmas". My dad lived in the mid-west and I live in Calif. I was never able to be with him at Christmas. Love the tags. I just got the bell die and I've been making Gift cards with them, Super simple but they look high end! Mary did you know. It brings tears to my eyes every time. Love, love, love this tag! My favorite Christmas song is Bing Crosby's version of "White Christmas." Though not technically a Christmas song I love Harry Connick Jr. and Lee Ann Womack's version on "Baby It's Cold Outside." I'll be home for Christmas is one of my favorite! I LOVE this tag. How simple and yet unique. Thank you for sharing. I love Christmas music and find myself humming along. My two favorite Christmas songs are White Christmas (yes, even though I do live in Alaska) and Oh Holy Night. Thanks so much for all your inspiration. Your tag is awesome. I want to try it. My favorite Christmas song is Ave Maria. Then my second favorite is Oh Holy Night. I will sing any of them too. So hard to choose because I love all Christmas music! O little town of Bethlehem is my top favorite but so many wonderful songs and artists! Silent Night is one of my favorites but this is a hard question! Thank you for the chance to win! What a delightful tag -- so festive! My favorite Christmas song is "Oh Holy Night!" I have loved it since I heard it for the first time as a young girl. It gave me such peace the first time I heard it and it continues to do so to this day. Love the tag! My favorite Christmas song(s) is Holy Night by Kate Smith. When I was child in the 60's growing up my mom had a few albums the family would listen to every Christmas during the Holidays. My favorite was the Kate Smith album! There was something moving in her rendition that would stir my soul even then as a young child. I was thinking just the other day about Kate Smith and that album! Time to go revisit that album. Thank you. So sweet of you, Paula, to have another giveaway. It gets me in the spirit of the holidays. My favorite Christmas song is "Oh Holy Night." It is so beautiful that it always makes me cry. Good luck everyone! There are so many Christmas songs that I love! It's hard to choose just one, but I think my favorite would have to be White Christmas by Bing Crosby. I just love his voice. As I celebrate 50 today, I always love Christmas songs of the Christmas shows I watched as a little girl....Charlie Brown Christmas with Snoopy on the piano or the little who's in the Grinch who Stole Christmas ...standing around the tree singing...brings me back to being that little girl with such excitement and love for the season! I forgot to mention the gorgeous tag! It is so pretty. Festive Berries and Evergreen Bough is quickly becoming 2 of my favorite Distress colors. I love that pine cone branch stamp, too. One can use that stamp on every winter or holiday card that they make. It is so versatile. Thank for the wonderful tutorial! Oh Holy Night is my favorite song. It always gets me in the Christmas spirit. I always finds myself looking at your gorgeous designs, studying the great tips and projects, that your share. Thank you for doing so! This makes me one of the lurkers on your blog I guess! my fav song, was always the Christmas song but I recently was introduced to a song by a dear friend of mine, Little boy drummer by the Pentatonix and I listen to it, every single day. My favourite Christmas song is Holly Night! Love it! My favorite Christmas song would have to be Blue Christmas sung by Elvis and Baby It's Cold Outside by Dean Martin. Hard to pick a favorite - but I think White Christmas tops the list. My favorite Christmas song is 'Silent Night'. It makes my heart swell with blessings just hearing the peaceful melody and words. Oh My Goodness but I LOVE that tag! I love tone on tone, monochromatic anyway and this one is just over the top gorgeous! Favorite Christmas Carol? Far and away, Oh Holy Night. Just sums it all up for me! Love your tag and its sooooo easy! My favorite Christmas song is White Christmas. Happy Holidays Paula. Winter Wonderland....I sing it year round and especially when it snows!!! Gabby's entry was especially heartwarming. Glad she won the drawing!! This tag is gorgeous! My favorite Christmas song is "Up on the Housetop". My favorite Christmas song is "I'll Be Home For Christmas". It always bring back memories of my Grandmother. Then, of course, 'Rockin Around the Christmas Tree' is a great sing-along tune. Love your tag! Favorite is "Oh Holy Night". Thanks for another great giveaway and I hope you and yours have a wonderful and happy holiday! Beautiful tag - love the layered background. One of my favorite Christmas songs is 'Angels We Have Heard on High'. Love hearing the chorus sung by a choir and singing along on Christmas morning. gabby will you send me your shipping address to paula@oneluckyday.net? Gabby--congrats! Wonderful memory you shared! Paula..There are SO many touching Christmas songs..So many fun Cheerful Christmas songs.. can I pick 3? A classic. "Silent Night"..wish everyone cold of heard this sung Christmas eve 1990 in the ICN (intensive care nursery) by the nurses...The baby beepers and alarms were calm for a few minutes.. still brings tears to my eyes. Fun.. Kelli Pickler's version of "Santa Baby"..oh that song, sung with her southern accent..adorable! Beautiful tag! Favorite song is "What Child is This", but for just fun and getting in the mood a rousing sing out loud refrain of "Jingle Bells" always does the trick! My favorite holiday songs are "the Christmas Song" and "Baby it's cold outside". I sing along whenever (and whereever -LOL) I hear them playing. My granddaughter at about age 3 was learning xmas songs at day school so when she came to stay with us for a weekend, she was singing more than talking! 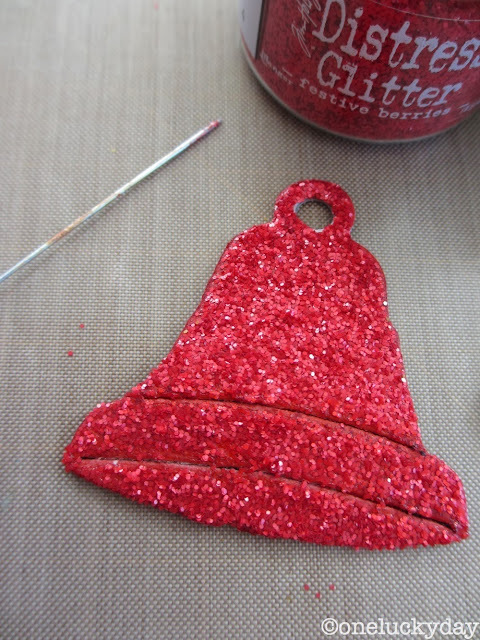 She made Jingle Bells my favorite when she sang in her sweet, enthusiastic voice, "... in a one horten sleigh ...". Otherwise, Jingle Bell Rock always got me rockin'! Love your clever background of reinking thru a stencil with the same color! Someone needs to write a new xmas song: All Is Beautiful At Paula's Blog. my favorite Christmas song is the little drummer boy. the first time i heard this song was a program by the choir of platte city jr. high. my son, who passed away 7 years ago was one of the singers and i still see his sweet face as he was singing this song. Love the tag Paula and thanks for each wonderful tutorial you bring to all of us. My favorite Christmas song is and has always been "Oh Holy Night." It always reminds me of the sacredness of this holiday season. Thanks for a chance to win and a very Merry Christmas to you and yours. I love all Christmas songs but my favorite would have to be The Little Drummer Boy, followed closely by Silent Night!! Your tag is gorgeous!! I love the sparkly ornaments!! They look amazing!! OOOh I love them all. But if I have to pick just one it would be singing Silent Night by candlelight in church on Christmas Eve with my family and friends. Oh Holy night ... love that song ... cannot sing it worth a darn, but i do try!!! My favourite Christmas song is Little Drummer Boy by David Bowie and Bing Cosby. Wow, what a beautiful tag! My favorite song is Silent Night and I love it no matter who is singing it or in any language. I get a lump in my throat and tears in my eyes every time I hear it. Just love the Harlequin stencil background, Paula! And the water spots--FAB! Verry nice tag!!! Growing up in a Polish Catholic neighborhood we were taught Polish Christmas carols at school. The prettiest was Lulajze Jezuniu, which is a lullaby to baby Jesus. Always brings a tear to my eyes when I hear it. So sweet. My Favorite Christmas Song is Dona Nobis Pacem/Joy to the World. My Mom and Dad would sing as a duet after midnight mass. The church would be silent, lights low, incense burning and all you could here were their voices. Then the organ pipes, which were from floor to cathedral ceiling, would sound and we all started to sing Joy to the World. People walking by would stop and voices would filter in from outside as well. Merry Christmas to all and "Grant Us Peace"! There's so many to choose from but one of my all-time favorites is Silver Bells (the Bing Crosby version, of course). Thanks for the giveaway! Love the tag - brings back memories of Christmas past. I have many favorite Christmas songs - but my top 2 are Carol of the Bells and Breath of Heaven. Merry Christmas and Happy New Year Paula! Joy to the World... it's all about Jesus! My favorite is "Do You Hear What I Hear?" but "Grandma Got Run Over By a Raindeer" always makes me giggle. Oh Holy Night is my favorite Christmas song -- closely followed by Jingle Bells! Merry Christmas to you!